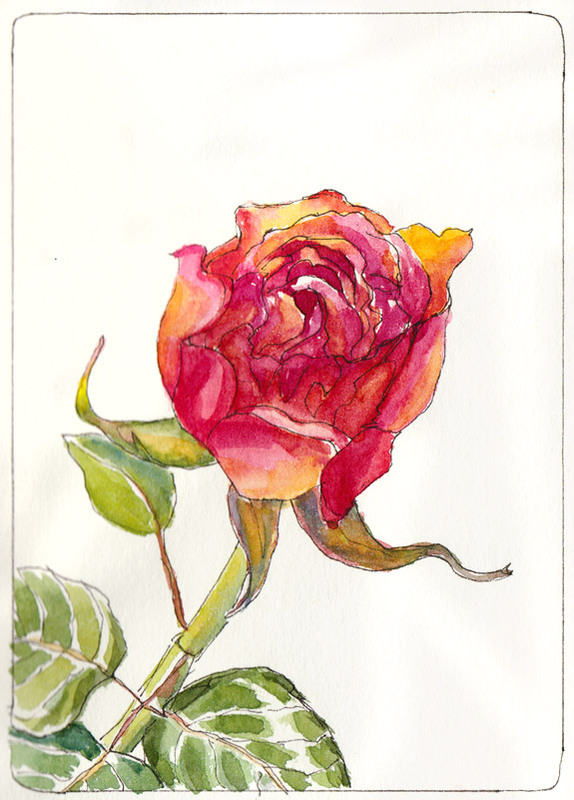 My rose bushes have started their first big bloom of the year (with no help from me) and despite a crazy week, I’ve tried to do a little sketching of the first two that were ready to cut. 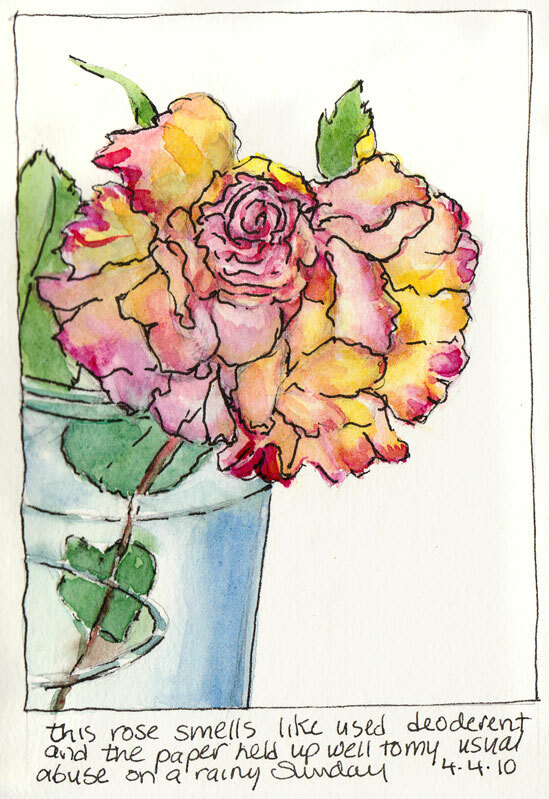 This is the second rose that bloomed, just picked (above) and a day after its peak (below), which I missed sketching yesterday because I just needed to sit in front of the TV last night and veg out. Oh well. The roses above have a lovely fruit punch scent, which is why I bought the bush originally. Here is the first rose of the season (below) from a different bush. I struggled with the sketch and the whole time was annoyed by the scent, trying to figure out what it reminded me of. I finally figured it out: an old brand of women’s deodorant that smelled kind of gross after it was worn for awhile. I’m overly sensitive to some smells and I’m guessing I might be allergic to them; that they smell differently to me than how they smell to others. My sister used to wear a perfume called Anais Anais that I thought smelled exactly like damp, moldy dog kibble. There are trees that when in bloom smell (to me) exactly like barf and give me an instant headache if I breathe when I walk by them. Could it just be me? Or do companies really make perfumes that smell like kibble and people plant trees that smelly pukey? 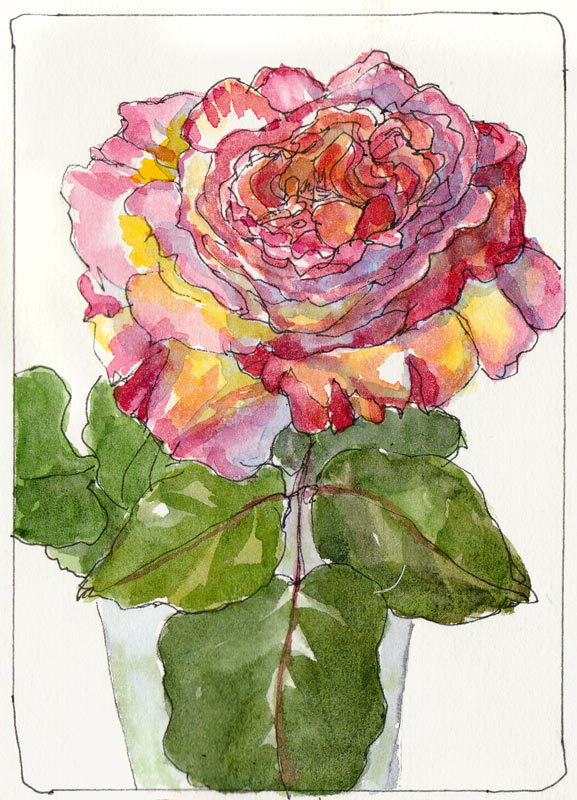 And back to the roses…doing these quickie sketches has stirred up the creative juices to do some “real” watercolor rose paintings, taking more time and care with the drawing and painting to accurately capture the interesting variations in color, shapes and patterns of the petals. It’s amazing, actually, that your flowers give off scent. Many varieties of roses have been bred for looks not scent! I love looking at the ways you suggest shape and color without painting a photographic portrait of your flowers. I need more courage to LEAVE THINGS ALONE! Jana: once again, you have inspired me! I don’t particularly focus on painting flowers, but our daughter is getting married in September, and sunflowers are her flower of choice. I want to do a painting of a single sunflower, then set it out for the guests to sign at the reception, to create a unique memento of their special day. Your roses look lovely. Amazing to see the difference only two days makes in them! As for smells, the one thing I can think of that strikes a similar chord are paperwhites, which appear around Christmastime and given as “special” gifts then. They smell like gym socks to me, but other people just love them. I don’t get it. I cracked up at your description of the scent of your sister’s favorite perfume! What I really admire about you, besides your stellar paintings, of course, is your ability to know what you need and then to do it! And it’s usually better than my default veg-out, grazing in the kitchen! The tree that smelled like dog barf was probably a fruiting ginkgo; the decaying fruit covering smell like that, at least in the US. And I’m with you on weird smells. For the longest time, when I went into one of our stores, I always smelled urine in one section (by food!) and couldn’t stand to buy anything there. I would mention it to people I was with, and they would look at me like I was crazy! Never figured out what it was, but it’s gone now…thank goodness! Lovely roses, Jana. But as for perfume–I HEAR you. A relative brought back an expensive perfume for me from France. I was thrilled. by its scent but in about an hour I smelled like a potty. I like the way you crop these sketches/paintings. I also like the looseness. Hadn’t seen your lovely Berkeley drawings before, but I think I know where that vegi place is in Vine St. We were there last Christmas. Wow, roses already? In Indy our roses don’t bloom until June. Great sketches. I absolutely love roses that smell but I know what you mean about funky scents. The ones that bother me are usually chemical, man made stuff – like lawn fertilizer. Beautiful roses Jana, must be nice to have them starting to bloom now. I’m personally a failure at growing plants, I love flowers but I’d just forget to water them. I really like the first rose, the colours are beautiful. I have my rosebush looking the best it ever has due to a rainy winter here in the desert and I didn’t even think to try painting one of its flowers. Oh my. Yours are looking very nice.